Snapchat: Hi, Hello, I'm Still Here. Please Stay. 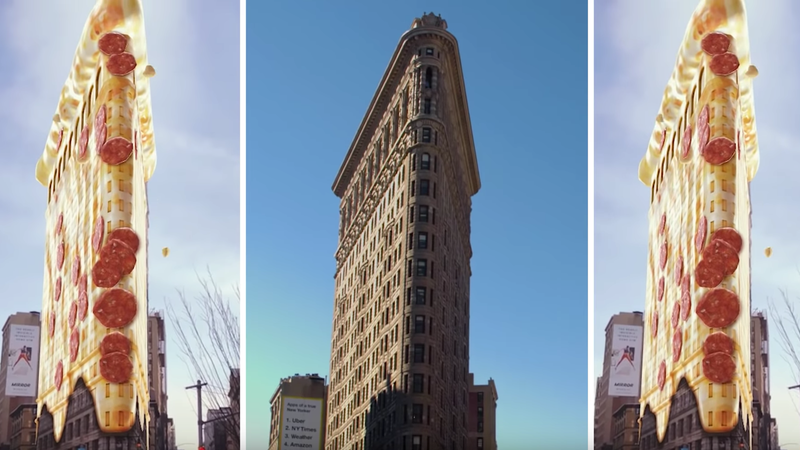 With the Landmarkers AR feature, you can turn the Flatiron Building into a pizza. In a bid to remain relevant, Snap Inc. has launched a slew of new products for its Snapchat app, including an augmented reality (AR) developer platform and a games platform. The announcements were made earlier today at the company’s first-ever Snap Partner Summit in Los Angeles. First up, Snap introduced Scan, a platform designed to let users interact with their surroundings using AR. The company has partnered with Photomath, a camera app that solves math problems, and Giphy. Basically what this means is you can point your phone camera at a math problem within the Snapchat app and get an answer. (Where was this when I was in Calculus class?) You can also point your phone at an object to bring up a relevant-and-humorous gif. For instance, say you point your phone camera at a slice of pizza. Giphy will then pull up a pizza gif to dance on top of your real-life pizza. Boom, content. You’d be correct in thinking Scan sounds awfully familiar to other camera-based search functions already available within Snapchat. For instance, you can already Shazam songs using the camera screen, as well as shop for items on Amazon. Scan is basically repackaging all of these features together under one umbrella via a new menu called the AR Bar. The company also launched an AR-based Landmarkers feature today, which lets you point your phone at a famous iconic landmark—say the Flatiron Building in NYC—and have it vomit animated rainbows, fireworks, and confetti. Aside from AR, Snap also debuted its Snap Games platform, which will let users play real-time, multiplayer games with each other. It’s sort of similar to Facebook Messenger’s Instant Games—except instead of porting well-known titles, Snap is focusing on original games. One example is Bitmoji Party, which is sort of like if Mario Party replaced its iconic characters for Bitmoji avatars. Snap has also partnered with some other recognizable mobile game companies, such as Zynga, ZeptoLab, and PikPok. If this sounds like Snapchat is throwing product pasta at a wall to see what sticks, you’re not too far off. These new features are coming at a time where Snap has just only managed to stop hemorrhaging daily users to Instagram. Even so, the numbers don’t look great for Snap. CBS News reported the company lost $192 million in Q4 of 2018. It’s likely Snap’s announcements are an all-out effort to reverse its fortunes and finally figure out a way to reliably monetize its user base. Conveniently, TechCrunch reports the company’s top executives are looking to switch up strategies from chasing user growth to making more ad money off the users it’s managed to keep. Hence, more non-chat focused AR features and games. It’s not exactly clear how Snap will monetize its AR efforts beyond branded partnerships for lenses, but for the gaming platform, the company will let users watch six-second ads in exchange for in-game power-ups or bonuses. Put simply, Snapchat wants you to know it’s still here and please, pretty please, don’t ditch it for Instagram.